Arriba Casino is an online casino guide with tips and tricks to improve your knowledge of gambling. That is what the pesky Warner Bros mouse used to say, right? Well, my casino site is so damn cool that it does not care about any kinds of critters. You perros! Okay. Maybe we are getting started off on a wrong foot… Allow me to introduce myself. My name is Hidalgo Durango and I am a Britt with either some Mexican roots or just a burning love for all things Mexican. I know that this stuff might sound a bit vague, but that is all you are going to get from me at this moment. Perhaps by actually reading my site you can find a bit more information about me. Or not. That is for me to know and for you to find out, is it not? Okay, I guess I can tell you some things about this little pet project of mine. 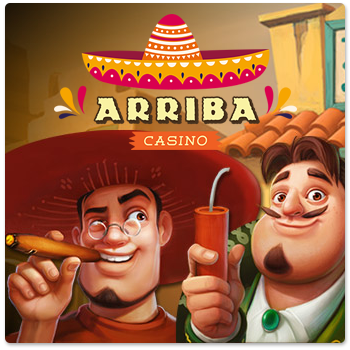 Arriba Casino is an online casino site that will let you read about all kinds of casino stuff. The reason why I started this site was simply because I was extremely bored and wanted to write about something. Now, I am quite a big fan of online casinos, so I thought that I might as well write about something that I care about. The reason why I brought Mexico into this is because I love tacos. Plain and simple. I honestly consider tacos to be the best things that you can eat and the best thing in life, period. Nothing beats playing at an online casino when eating tacos at the same time, though. Some of the things that I will probably talk about are casino bonuses, best casinos, new casinos, online gambling, sports betting, and more. I have no doubt that you are going to love my stuff, and there are two reasons why I am so certain of this. Firstly, I have heaps of online casino experience and you can leech off of me and gain some experience for yourself in the process. And secondly, I am a supremely great writer who always used to get straight A’s for my writing. Or at least B’s. Or at least C’s. Man, I cannot remember, it was a few years ago and long before I started boozing… Hehe. I really hope that my time and effort are not going to go to waste. This is why you should read every little detail and word that I write here. Capisce? Good! May you find meaning in your life by reading my ramblings, perro! Now go have yourself a taco!